Handcrafted Metal makes exquisite stainless steel kitchen countertops to suit your taste and accommodate your kitchen. With us you can customize every dimension and feature. You can also add detailing, such as fancy edges, backsplashes, hammering, and drainboards, to give your stainless ktichen countertop a powerful presence in your kitchen. Each stainless countertop is fully welded and polished, and made with 14 gauge stainless steel, which is 25% thicker than 16 gauge. Feel free to choose how your stainless steel kitchen countertop will look, by combining our custom features into the perfect custom stainless steel kitchen countertop for your kitchen. We will work with you to produce a work of art for your kitchen. To get started, click any of the stainless kitchen countertops below to see pricing and customize your dimensions and features. This sleek square-edged countertop has a zen-like presence with no ornamentation and simple lines. The large 2-compartment sink, ribbed drainboard, marine edges, and 10" backsplash combine to provide superb water control. The stainless steel towel bar accents the front of the flush apron. It's made from 14 gauge stainless steel, and has our Grain finish. Our Claire marine edge gives this extra deep top the flavor of the fifties. The large double sink is made of 2 20" x 18" sinks that are 9" deep, and the matching drainboard provides a professional work environment. Smooth stainless, straight line micrograin finish. This countertop is designed for maximum utility and ease of cleaning. The marine edge on the front edge turns spills back onto the deck. The backsplash has an easy-clean radius where it meets the deck. A 16" long drainboard on the left and right side of the 22" x 16" sinks provides a drain area for each sink. Electrical outlet openings allow for plenty of electrical boxes. It's made from smooth 14 gauge stainless and has our micrograin finish. This tall 18" backsplash extends water protection up the wall. The square apron has a very small top to allow the sink to be positioned as far forward as possible. The sink extends through the front wall of the cabinet and is hidden by the apron. Drainboards give plenty of drying space. Smooth stainless, straight line micrograin finish. This centered layout provides a serene balance. The ribbed drainboards speed drying time. Splashes on 3 sides keep water away from walls. Smooth stainless, straight line micrograin finish. This 15 foot long industrial work center features our Matte finish, marine edge, tall splash, large 3-compartment sink, and flanking drainboards on both sides of the sinks. The piece is fully welded and polished to be a single, seamless top. 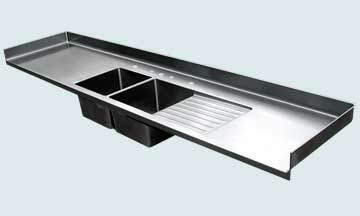 The left sink and drainboard are larger front-to-back. The entire piece is smooth stainless with a matte finish. Whimsical stainless sets in an alcove! The front edge is bullnose for a smooth, rounded look. Random Overlay is one of our special finishes that David developed with the polishers. It is hand made and never is an exact duplicate of another top. The general effect is always the same. 14 gauge stainless - welded and polished before final finish. The free-form wavy splash of this top is reflected in the smooth deck like mountains in a lake. Our butterfly finish on the splash hints of trees on slopes. The soft bullnose front edge is consistent with the almost organic quality of this countertop. Smooth stainless, straight line micrograin deck, butterfly finish on splash. A simple design with an angled extension on the front deck. Smooth stainless, straight line micrograin finish. Our Matte finish gives this stainless piece a fine neutral gray tone. We rounded the corners of the extended front to compliment the coves inside the integral bar sink. On the left end the backsplash jogs around an offset in the wall. The entire piece is made from smooth stainless, and has our Matte finish. Plenty of faucet holes are behind this integral 12" deep sink. The 4" tall splashes protect the walls, and the micrograin finish shines the stainless to compliment the stainless appliances in the kitchen. 14 gauge stainless is fully welded and polished. We shipped this 14 ft. long top in one piece. The bullnose edge has a solid feel, while the butterfly finish delivers sparkle and a lively dance of light. The micrograin finish inside the integral sink provides a contrasting pattern-free accent. Smooth 14 gauge stainless, butterfly finish on deck, micrograin finish in sink. 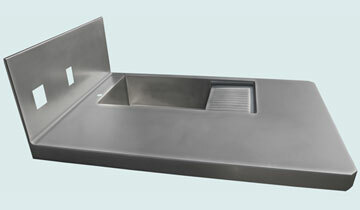 This compact countertop features an integral sink with real stainless steel woven apron. The apron is flush to the front edge of the countertop. The ribbed drainboard and 6" tall splash put you firmly in control of the water in your sink area. The left front corner is angled to soften the corner for an open walkway. 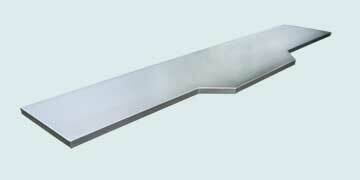 This countertop is all welded and polished 14 gauge stainless and is completely free of seams. Smooth stainless, straight micrograin finish. This stainless work center was set between 2 walls to provide an easy-clean impervious wet zone. A short splash behind the sinks prevents water from escaping down the back wall. The ribbed drainboard and vegetable prep sink on the left compliment the deep main sink. The lowered divider between the sinks allows overflow from one sink to the other. Smooth stainless with a fine matte finish. 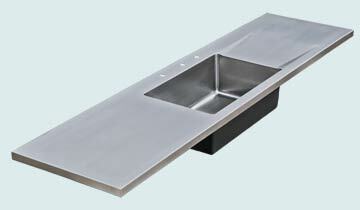 The integral bar sink is 20" x 20" and is 10" deep. Cut-outs are for stove, trash chute, and 3 electrical boxes located on the back splash. 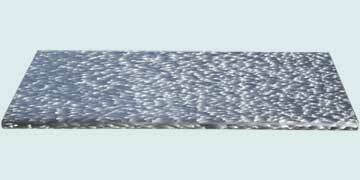 Marine edges keep water off the floor. These are 2" tall to give the piece a bold look. 14 gauge stainless is fully welded and polished before the final matte finish is complete. This high-durability kitchen center was installed between 2 pieces of granite. The shortened apron clears tall doors below. Because the sink extends below the apron, the sink had to be positioned inside the cabinet wall. The bullnose edge curls under and pushes the apron back. The result is a 3 inch wide deck in front of the sink and an overall wider top. Smooth stainless, straight line micrograin finish. This simple bullnose breakfast bar is livened up with our butterfly finish. This top is notched where it touches a wall at the right end. Smooth 14 gauge stainless, butterfly finish. An ultra-practical 2-compartment sink and right hand drainboard make for a quick cleanup. Coves where splashes turn up make cleaning easy. Smooth stainless, straight line micrograin finish. A very simple top is notched at the right side of the splash to fit the wall of the bar above. The top continues past for an overhang. These photos capture the highlights we give the edges of our stainless tops. The final finish is micrograin on 14 gauge stainless. Handcrafted Metal takes pride in our very high quality craftsmanship. We see your Stainless Kitchen Countertops order as an opportunity to deliver our uncompromising design and craftsmanship. You can see that we offer a large number and an amazing variety of Stainless kitchen countertops designs. Our 25 years of experience in building stainless kitchen counters tops in every size, shape, and color gives us mastery of the essential methods, processes, and skills needed to produce a stainless steel kitchen top that exceeds your expectations. We have built thousands of Stainless Kitchen Countertops. The vast array of styles, finishes, textures, and metals available for Handcrafted Metal Kitchen countertops provide almost unlimited choices. We offer an extensive selection of Stainless Kitchen Countertop styles. Just browse the Style to see wide range of stainless kitchen countertop products with the options of integral sinks. We are glad to answer any questions about any of our Stainless Kitchen Countertops. Call 1-800-755-0310 to speak with a product specialist who will help you select and configure your ideal custom stainless kitchen top. Handcrafted Metal Custom Stainless Kitchen Countertop and Kitchen top are built in a way to be the focal point of your kitchen or Bar.